Right-click on the downloaded file and select ‘Open with…’ and choose Google Earth. If you don’t have it, you can download Google Earth here. Amazing that technology developed for guided missiles can be so useful. Great to see you use location technology, had fun with it and shared the info with others. Everything in the world seems to go in that direction: location-based:). Do you have tracks in kmz format as well? I am planning to travel in Zambia in the near future. It will be great to familiarize myself with the area before going to the places there. I am afraid I only have the klm file. If you follow the instruction in the post the waypoints will open in Google Earth. I’ve just tested it to make sure! However . . . you might want keep an eye on this site: zambiatrails.com (which I’m involved in) where we are trying to provide a place for people to upload their, ah, Zambia trails. 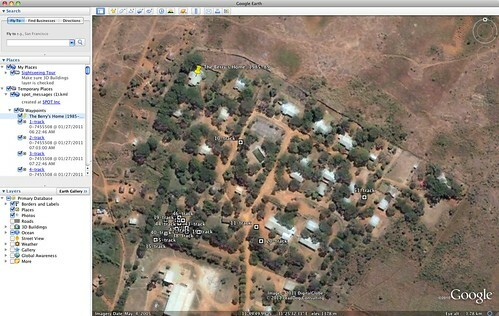 Fun with a GPS & Google Earth – where we went in Zambia for Colalife: https://bit.ly/fzTUBe Just like being there!